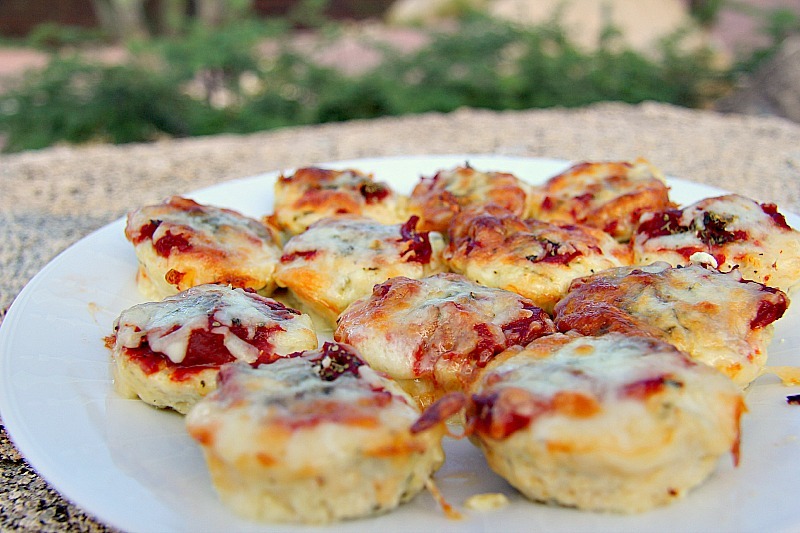 Mini chicken pizza bites make a great snack or appetiser and best of all, they are low carb and gluten free! 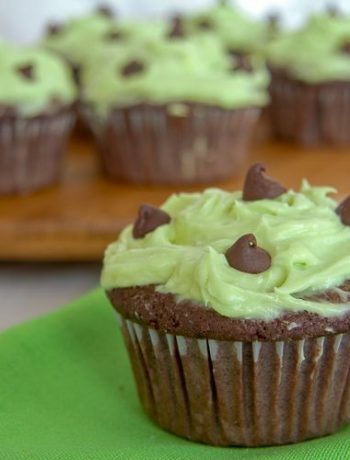 They are easy to make and can be whipped up in minutes. A recipe that even children and my husband could make too! I was having a Sunday afternoon baking session since there was a Formula 1 race on that day and we have a strange superstition that if I bake then our driver wins. If not we console ourselves with tasty treats so we win either way! There was a packet of minced chicken in the fridge that I was either going to give to the dogs for a treat or make chicken burgers with. By now the Chief Taster had a couple of glasses of wine and I thought it best to quickly feed him before he reached for another glass. I had not intended to make a recipe but the result was so good that it made the blog! 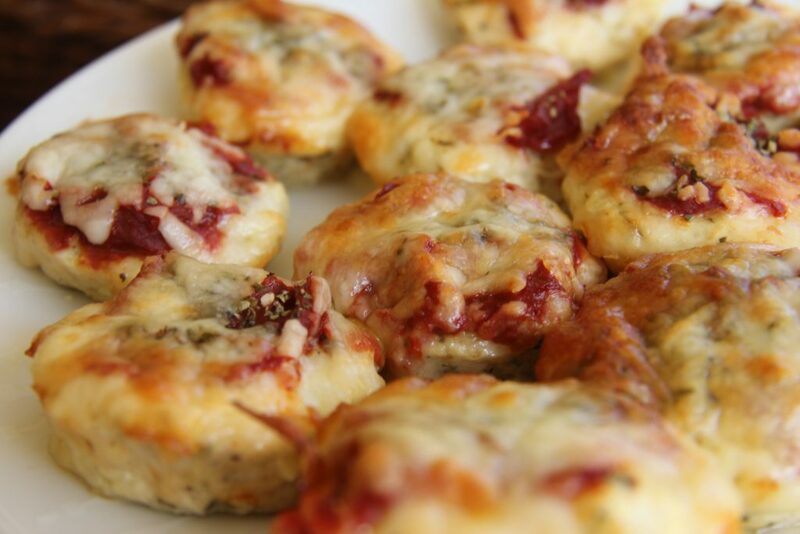 Making these is as simple as adding mince chicken, cheese and flavourings. 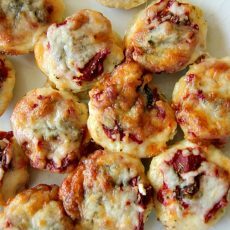 Press them down in a muffin tin, cook, top and voila! Treats all round! 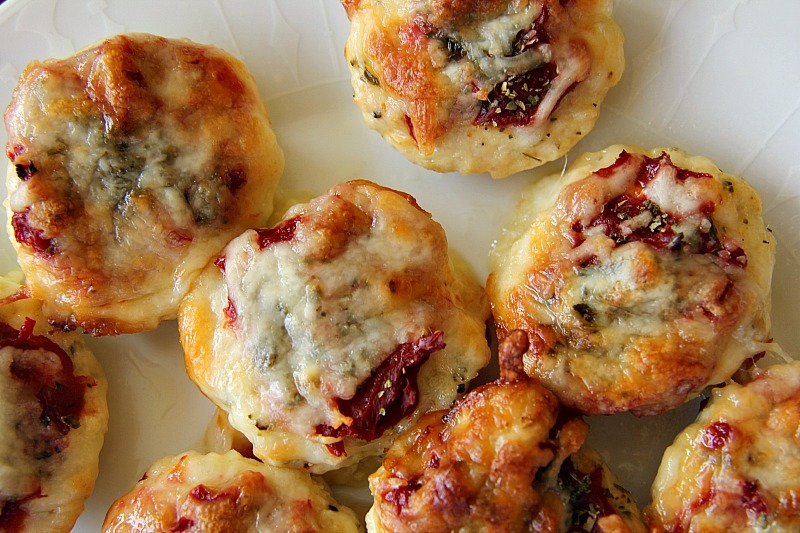 I used a regular muffin tin but mini muffins would be cute and an elegant appetiser. This recipe made 12 chicken pizza bites. They did not last long and the Chief Taster drooled over every bite. The upside was that it saved me additional baking of a meal that day. Once he was full of these plus the cookies I had baked he was pretty much done for the day. The wine may have helped too. I just topped the chicken pizza bites with a simple Marinara sauce and more cheese. You could add other toppings as you wish. Perhaps some olives and sweet peppers? As I was pressing the mixture into the muffin tin, it occurred to me that this mixture would also make a great low carb pizza base. It redefines the terms “Meat Lovers” pizza! Slap some grilled chicken onto and you have a double chicken dish! If you don’t have a muffin tin you could make these by rolling out balls on a parchment paper lined baking tray. Press them down into circle and you are good to go! Lightly oil a muffin tin. In a bowl add the chicken, cheeses and egg. Mix until combined. Add the seasonings and work them into a mixture. You should have a dough like consistency. Spoon the chicken mixture into the muffin tin and press down. Bake for 12 minutes until firm. 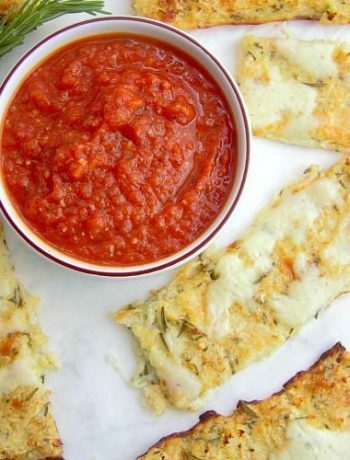 Remove and spread the chicken bites with the Marinara sauce, then sprinkle with the Mozzarella cheese. Place under a medium grill for 5 minutes until the cheese is golden. I made these tonight for the Patriot’s playoff game. I bought a cooked whole chicken from BJ’s and deboned it this morning. I only used 3 cups of chicken, I chopped it by hand and then put it in my food processor. I filled them about half way in the muffin times and cooked them a few more minutes then the recipe. They came out delicious. I am on the keto diet and to have yummy pizzas without a bread crust is wonderful. These are my new go to appetizers. Hope your team won! These could be your next lucky snacks! Glad you enjoyed the recipe! Yes you can. I’ve tried it with both for the husband. I just tried this dish and omg it’s amazing! You say use 500 g of chicken. How many cups if cooked chicken is that? About 3 to 4 cups. I’ve made this without measuring it too and it works out fine. This looks great! Have you ever frozen them and reheated? No I haven’t but they should be good to freeze. Is this ground chicken or finely chopped raw chicken? It was raw chicken blitzed in the food processor. You could use raw chicken mince too. Sorry for the probably silly question- is the chicken raw? I think so from your comments, but I bet this would work with finely chopped cooked chicken- the egg would bind it, and the cheese would help….thanks! Hi, yes it is raw. You are right about the finely chopped chicken though. What a great idea! Thanks- it looks so good!